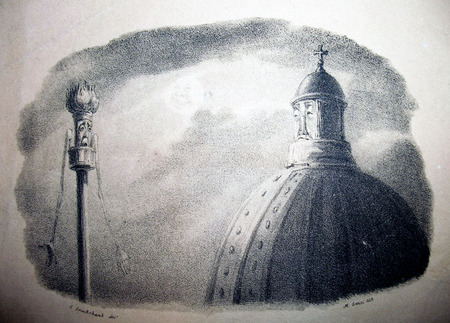 George Cruikshank’s illustrated sheet music presents the Monument to the Great Fire of London speaking with St. Paul’s Cathedral in the City of London. The Monument, located near the northern end of the London Bridge, is a Roman Doric column topped with a gilded urn of fire, designed by the architect Christopher Wren (1632-1723). St. Paul’s Cathedral, a few blocks away, was also designed by Wren between 1675 and 1710, after its predecessor was destroyed in the same fire. 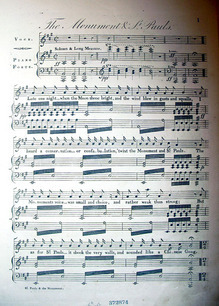 The music presented here is by the British composer Jonathan Blewitt, who spent time as a young man in Dublin as director to the Theatre Royal and the grand organist to the masonic body of Ireland. Around 1825, Blewitt returned to London, where he wrote pantomimes, musical plays, and light operas. His last work, the pantomime Harlequin Hudibras, was performed at Drury Lane on December 27, 1852. At various times, he also served as music director for Sadler’s Wells Theatre, Vauxhall, and at the Tivoli Gardens. The vocalist may have been the actor Edward Fitzwilliam (1788-1852), who performed in various London theaters at roughly the same time as Blewitt. 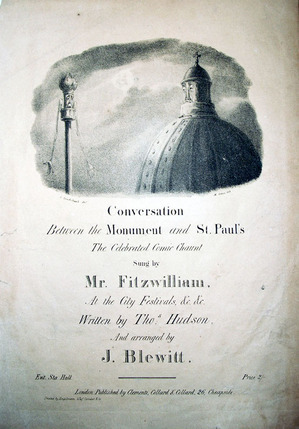 Fitzwilliam joined the company at Drury Lane in 1821, specializing in Irish roles. I heard a conver sation - or confa bu lation, ‘twixt the Monument and St. Pauls. But as for St. Pauls - it shook the very walls, and sounded like a chi nese Gong. 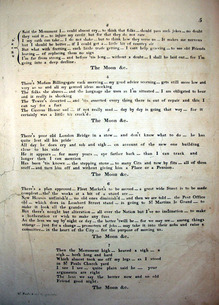 I was wondering where you managed to find the copies of the lyrics and sheet music in the images you've shown, as I'm trying to get hold of the whole song for some research i'm doing.